The Community Tree Preservation Division administers the City's Tree regulations by performing tree reviews, permitting, and inspections, and implements the Urban Forest Master Plan. The Division serves to cultivate a relationship between Austin residents and their trees by fostering a resilient community forest accomplished through an interconnected mix of regulations, planning, and community partnerships. The City Arborist Program issues development and non-construction-related tree permits for residential and commercial properties in compliance with Chapter 25-8, Subchapter B of the Land Development Code. Design criteria needed to achieve the tree and natural area preservation goals identified in the Land Development Code are contained in the Environmental Criteria Manual (Section 3, Tree and Natural Area Preservation). Click here to learn more about the tree requirements, and the tree review and application process for residential and commercial properties. Click here to view active tree permits. Austin’s urban forest provides millions of dollars annually in social, economic, and environmental benefits to the community and enhances the quality of life for Austin residents. The City's Urban Forest Plan: A Master Plan for Public Property establishes a broad coped long range vision for Austin's public urban forest. 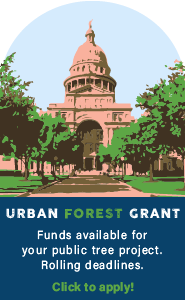 Click here to learn more about the City's efforts to implement the Urban Forest Plan, including a Tree Planting Priority Map, an interactive webmap and data, and the grant program which provides funding for public tree related projects in Austin. Call 311 to report illegal tree removals or general tree-related questions. Call 3-1-1 (inside the city limits), or 512-974-2000 (outside the city limits) for review and permitting information. Apply for an Urban Forest Grant!